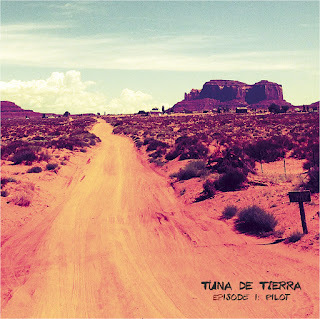 'Italian desert rock' may not be a phrase you hear that often (unless you're actively looking for it), but this debut EP from Tuna de Tierra ('tuna of the land', playing off of 'chicken of the sea'?) goes a way towards adjusting that probability with its three tracks. Aiming for a more sedate and less 'brains cooked by the sun' mood with the chunky grooves, the music (especially opening track "Red Sun") can make you feel like a lizard who's managed to scuttle his way into some shade at high noon while everything else is rushing about the sands (assuming you're willing to take the 'desert' part of desert rock that literally). With a very solid mesh of the three-piece's instruments and guitarist Alessio De Cicco's vocals, the songs get a strong flow going from which it's hard to extract yourself; just the way you want the tease of a first EP to work. Closing things with a relatively quick track (one with caravan-like hand-drums put into play) after the big first two reinforces that lure, giving this a hefty amount of replay resilience so you can soak up the heat without a care. Going by this admirable start, Tuna de Tierra should have plenty of ears attuned for their further musical explorations.